Daily dose of false propaganda, communal messages, videos and hate can wreak havoc. 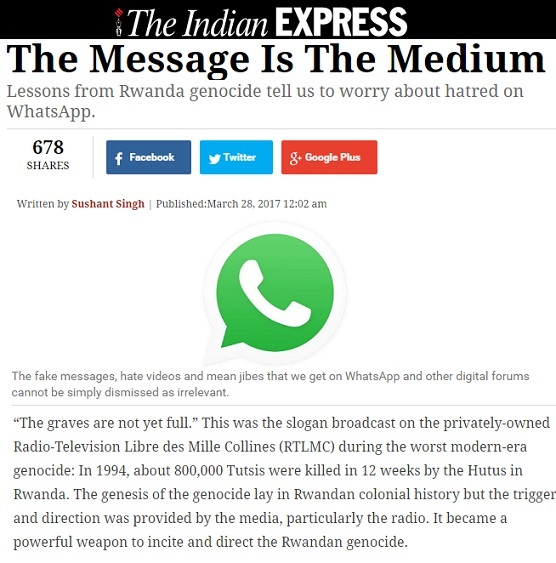 'The message is the medium' is an important article on this subject, which tells us how similar propaganda led to the genocide in Rwanda where 8 lakh people were killed in just 12 weeks. Sushant Singh's powerful piece should wake us up about the situation that is arising because of such propaganda, false messages, unverified videos that are forwarded--incident of another country, termed as an incident here and blaming certain groups, even imaginary and absolutely false stories to spread communalism. "From early 1990, anti-Tutsi articles and graphic cartoons had begun appearing in the Kangura newspaper. In June 1993, the RTLMC began broadcasting in Rwanda. The radio station was rowdy and used language of the street — like any other popular radio station, there were disc jockeys, pop music and phone-ins. It was designed to appeal to the unemployed, the delinquents and the gangs of thugs in the militia...", says the article. "The transcripts of RTLMC’s broadcasts are available in Duke University’s International Monitor Institute. A lot of attention has since been focused on the radio station’s efforts to direct the extermination — broadcasts told people to “go to work” and everyone knew that meant get your machete and kill Tutsis. But what has escaped greater scrutiny is the manner — by demonising the Tutsis and encouraging hate and violence — in which the radio station prepared the ground among the people of Rwanda for genocide. The transcripts reveal RTLMC’s efforts to claim authority over the telling of Rwandan history whereby the hardline Hutu extremists exercised a monopoly over the truth". "If radio was a powerful medium then, where you only needed a transistor and a few batteries, we have the smart phone and WhatsApp today. In the past few years, several instances have come to light where communal clashes are being planned or instigated through false videos circulating on WhatsApp." "The police acknowledged that WhatsApp groups were used to incite the Muzaffarnagar riots in UP in the run-up to the 2014 elections. The gau rakshaks, the Jat agitators, and protestors in Kashmir also take advantage of WhatsApp groups to organise themselves." "The government has responded by banning internet in such instances, making India the global leader in imposing internet blackouts. That is a tactical solution which prevents immediate violence. But the graver challenge of creating a fertile environment of hate, round-the-clock, by distorted story-telling continues unabated. It is not just the poor and semi-educated who are taken in by the alternative narrative of political propaganda on WhatsApp. The educated elite are equally guilty". The complete article is available at the Indian Express website. Yogi Adityanath will be chief minister of Uttar Pradesh. On social media, several people reacted as if something earth-shaking had happened and as if it was unexpected. Why? Didn't you see it coming? 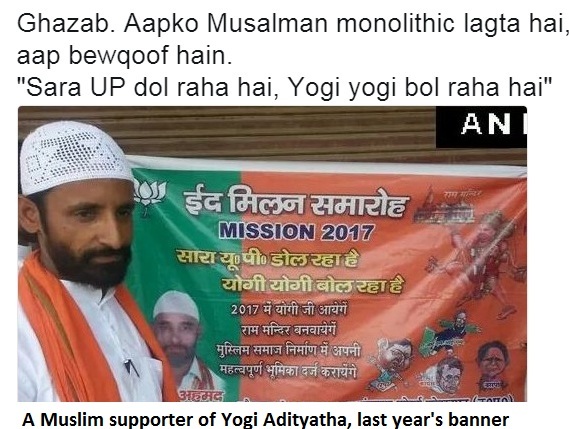 Ahmed bhai had already sensed it and was supporting Yogi Adityanath even when the election campaign hadn't begun at all. Call him opportunistic or whatever, but there were guys who knew Yogi's time was coming. And you call Muslims monolithic! There were some who even said that they wanted Yogi at any cost. "No BJP, Yogi first. We prefer Yogi", that was the slogan too in Gorakhpur and surrounding region. 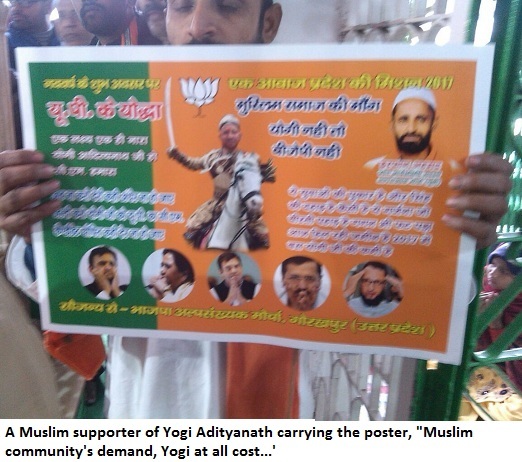 So when the 'Hindu-wadi' leader had so much support even among Muslims, just imagine the support among Hindus!!! We have seen the rule of GB Pant, Sampoornanand, the most hated UP CM Vir Bahadur Singh and Kalyan Singh. Now, we will see Yogi Adityanath leading India's most populous state, too. Bihar has been a citadel of Urdu for ages. The state has more Urdu readers than many of the North Indian states. 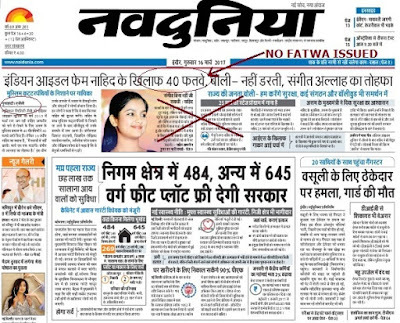 In fact, Patna has nearly a dozen major Urdu papers published from the city. The photograph [Courtesy Mahtab Alam sahab] on the left shows many papers. While many Urdu speakers in Uttar Pradesh had a superiority complex in terms of Urdu and felt that they were guardians of the zabaan, truth is that Bihar has been more fertile for Urdu post-independence. Though I am a UP wala, but I have to admit the fact. 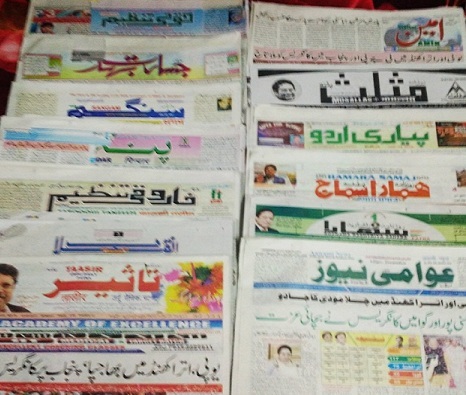 These are the Urdu newspapers published from Patna, the capital of Bihar. 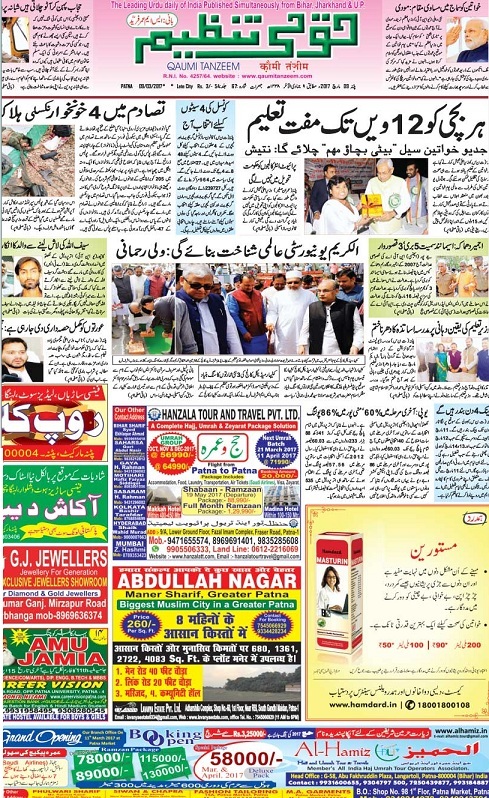 You can find the major papers like Qaumi Tanzeem, Taseer, Inquilab, Pindar, Jasarat-e-Bihar, Farooqui Tanzeem, Ameen, Pyari Urdu, Hamara Samaj, Sangam and Awami News. There are some other papers too published from Bihar. Akhbar-e-Mashriq has an edition too. Bihar had thousands of Urdu schools till a few decades back and still there are Urdu schools across the state though UP has none. In the last two decades, Urdu journalism has seen a revival. Though Urdu papers were strong in Hyderabad, Telangana [earlier Andhra Pradesh], Karnataka, Maharashtra and Kashmir, the situation once again improved in North India. In Delhi and UP, there are many big newspapers now. 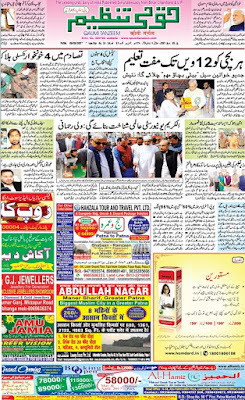 West Bengal and Jharkhand too has several Urdu papers. However, the situation in Madhya Pradesh is not as good, as there are few papers with declining circulation. Among big states, Rajasthan and Gujarat don't have Urdu newspapers though almost all the states from JK, Punjab in the North to Tamil Nadu in the South, have Urdu publications. This is an example of what plagues journalism today. 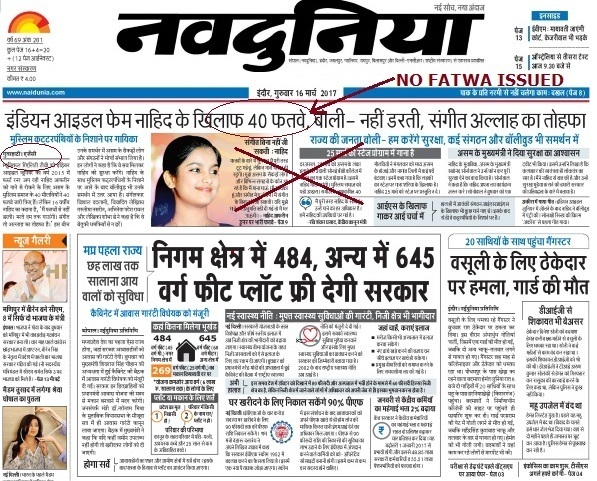 Hindi newspaper Nai Dunia [Nav Dunia in Bhopal], published a false story about '40 fatwas against a Muslim girl' for singing bhajans. The truth is that there was not even a single fatwa against Nahid Hasan, the teenaged singer. It seems that the pamphlet in Assamese was not even read correctly. Earlier, even TV channels had carried the story that the Muslim girl was stopped from singing by Ulema. 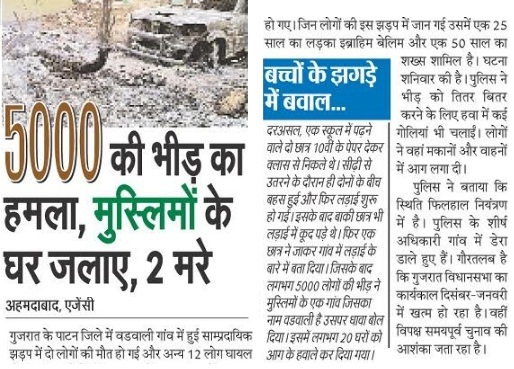 Even CM tweeted about it and the imaginary fatwas created outrage. In fact, the pamphlet did not even mention her name. The pramphlet said that events shouldn't be held close to mosques, grave yards et al. 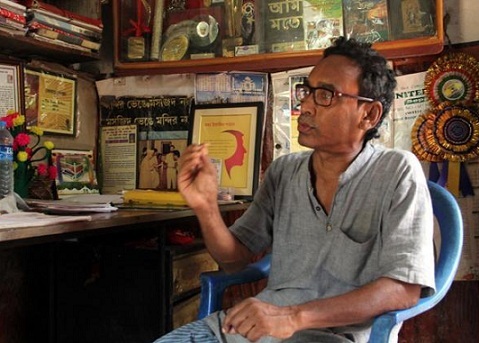 Scroll.in reported 'The fatwa against Assamese singer that never was...'. Subsequently, many journalists apologised for the haste and the irresponsible reporting. If there was a pamphlet that objected to holding an event, it should be reported that way only. Nai Dunia was once considered a respected newspaper in Central India. It is published in both MP and Chhattisgarh. Originally it was named Nai Dunia but after a title dispute, some of its editions are sold by the name 'Nav Dunia. Jagran group has taken it over sometime ago. The fact remains that any story about 'Fatwa', even if totally imaginary, sends certain media houses into a frenzy. This is a reflection of the bigotry and inherent biases against Islam and Muslims in the media. However, we stand by Nahid Hasan's right to sing and if there any attempt to stop her freedom to sing, we are against it, and extend our support. In fact, papers issue fatwas these days. We hope such papers will be careful in future and won't issue 'Fatwas' on their own. Press council must take serious action and stop the channels & papers from imagining, inventing and issuing fatwas. As Samajwadi Party's five year term in Uttar Pradesh comes to an end, I feel compelled to write you this letter, especially, in wake of the Assembly poll results. Every citizen has hopes from the government and leaders. I too have such expectations and hence I felt that I should communicate my thoughts to you. Five years ago, in 2012, your party had got overwhelming support from different sections of the society. Like other communities, Muslims had also voted for your party in a big way. After SP won, the party didn't pay much attention to most of the promises made in the manifesto. The party had promised better representation to Muslims in police apart from reservation in jobs and opening Urdu schools, educational institutions in areas with Muslim population and action in case of youths framed in false cases. One doesn't expect every promise to be fulfilled but there is always the hope that at least some attention will be paid to what was mentioned in the manifesto. Sadly, this didn't happen. What came as a big disappointment was the handling of Muzaffarnagar riots. If, at all, top government functionaries had reached the spot immediately, got local administration to act tough and given call for Army promptly, the violence may have been controlled in the beginning. It was the worst communal conflagration in this decade in the entire country and made thousands of people refugees on their own land. No other state, with the exception of Assam (where Congress was in power then during Kokrajhar killings) had witnessed such scale of killings and displacement in recent years. I feel that even after the riot, due steps that could have helped people gain confidence, were not taken. People remained in camps through the harsh winter. Financial compensation can never be substitute for human lives, their sufferings. Besides, there wasn't seriousness in ensuring justice for women who faced sexual violence during the Muzaffarnagar riot. I do not doubt your intentions for development. But the failure to control law-and-order and inability to rein in rabble-rousers was evident. How could things turn communal every now and then? How could Dadri happen? The government had a full majority and yet the administration wasn't able to deal with communal elements sternly. If there is will, there can't be a riot. Strong governments don't allow riots and don't let incidents to take communal turn easily. Many of my friends who are supporters of Samajwadi Party or are close to it, put blame on the 'rivals' for propaganda and for creating communal disturbances. They kept saying that things were given communal turn to pit communities against each other. But that's what one expects a strong government to do--to deal with such elements in a strong way. I do remember an instance when a riot had begun and immediately the DM-SP were changed (new officers sent by helicopter). That was well over a decade ago. Now that your party is in the Opposition, I hope the experience during the last five years, will help you a lot. We hope that the party that prides itself on principles of social justice, will take up issues of the ordinary people, the poor and backward communities in the state, work on the ground and ensure that there is no communal violence. Your party has several MPs and scores of MLAs. SP has a strong organisation up to village level in every corner of Uttar Pradesh. I hope your party workers and leaders will join hands with common men, help raise their voice and redress their grievances. An active opposition can do wonders in a democracy. I wish a party like SP could form communal harmony morchas that would take this message to people and ensure that harmony prevails. Besides, I hope SP will be keeping eye on implementation of schemes and raising issues that affect people--health, education, employment opportunities and corruption. However, I wish your government had at least amended the Congress-era discriminatory law that bars Urdu as medium of instruction in UP schools. If only you had taken this step, you would have taken a step which we would never have forgotten. Elections come and go. Lok Sabha elections aren't too far, barely two years from now. However, the issues remain and we do expect our leaders to come up with solutions. As an Indian citizen with roots in Uttar Pradesh (hailing from Lucknow), I thought I would share my concerns. Hope you would take them positively. After all, your party plays the role of the main opposition in UP Assembly, now. This is the biggest terror strike this year. Twelve Central Reserve Police Force (CRPF) personnel were killed in a blast in Chhattisgarh. 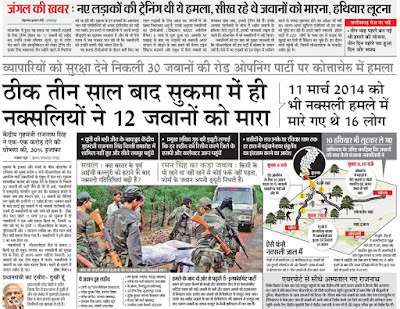 The Maoists triggered a landmine blast, which caused deaths of the security personnel. The incident occurred in Sukma district. The Maoists also looted the weapons and managed to escape. Yet, the news of this ambush didn't stir Indian media. It was Uttar Pradesh election that was important, and hence the news didn't have much interest for media personnel. 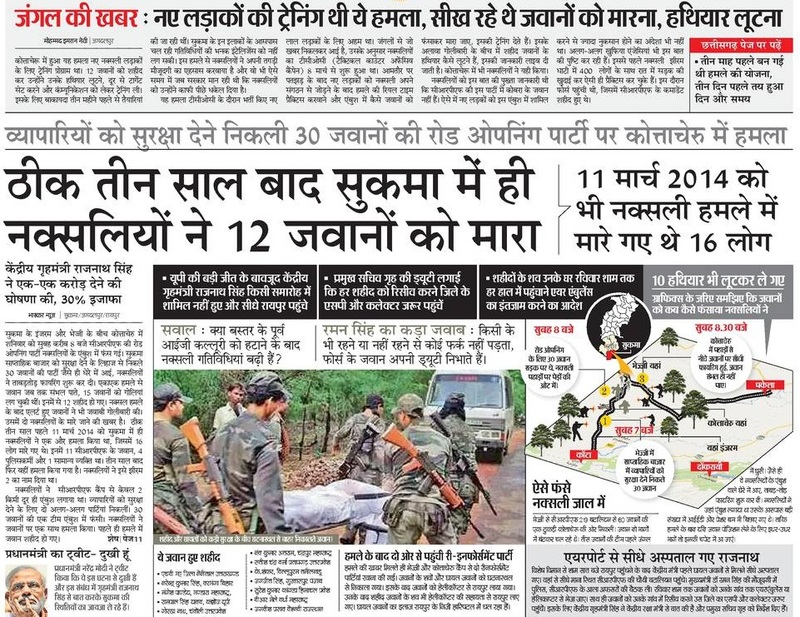 Besides, the suspects were Maoists and the incident was in rural part of Chhattisgarh. Hence, no TRP and no interest. Neither there was any discussion about the 'dalam' involved, its leaders or their names. Those killed included one inspector, two sub-inspectors, one head-constable and eight constables. There were no mention of the names of these martyrs in national media. No sympathy or candle light vigil or even tributes. No reporters visited the families of these martyrs or raised questions about whether VIPs even attended funerals or not, how much compensation was announced and how martyrs' families would not lead their lives. Political parties didn't say much. There were customary condolence messages but no protests or demonstrations. Even Opposition parties were silent--no demand for CM's resignation or even statements about poor law-and-order situation. In the newspapers next day, it was carried but not as lead or as a major national news. Indian Express carried it in a single column. Hindustan Times probably didn't carry the report at all. At least, I couldn't find it even in brief. A day later, most papers didn't even carry a follow-up. This is unlike the recent incident in Lucknow where a terror suspect was gunned down and it dominated prime time news. Saifullah was not accused of any killing. Yet, the encounter made headlines and was telecast live. In sharp contrast, the biggest militant attack on security personnel, got little coverage. Online too, the few papers that carried the story, had plain coverage, based on agency reports. BJP victory in Uttar Pradesh: How much media contributed to the wave? The Bharatiya Janata Party (BJP) has swept the Assembly election. The scale of victory has been unprecedented. BJP and its allies won 325 seats out of 403. That's more than 3/4th majority. BJP alone got 312 seats. SP got just 47 seats, BSP 19 and Congress 7. Clearly, the credit goes to BJP poll managers. You have to give it to them. The party managed to win the State. Even exit polls didn't predict such a tsunami. Even though journalists were saying that there is no wave, in the end BJP decimated the entire opposition. Even if there was an under-current, nothing was visible. How? It seems media helped create the wave. 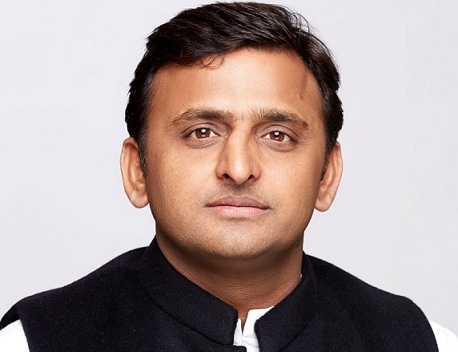 Till a few days before polling, SP was dominating the headlines because of the family feud. But, as election dates came closer, there was a sudden media attention towards BJP. Local Hindi media, which is known for its pro-BJP stand, began saying that the BJP was very much in the fray. Soon, channels were now reporting that BJP was all set to gain ground. Dainik Jagran published an opinion poll even though it violated guidelines, to suggest that BJP was ahead in the election. This was planned strategy. Steadily this created an impression that BJP was not a spoiler but a major player. Now, round the clock, TV channels began focusing on BJP. BJP supporters were interviewed and this was aired. With news channels beaming it day and night, there was an impression that BJP was the party that was heading forward. Voters were probably not happy with SP-Congress coalition, BSP had failed to gauge the public mood. Hence, BJP was surging ahead. Media helped the party gain momentum. Perhaps, this resulted in the situation that finally a wave was created. The voter is not a fool but he/she doesn't waste vote of losing party. There is impact when they hear that a party is winning. And, the fence-sitters too decide that they would vote. It's a trend. And this probably happened in Uttar Pradesh. Media has an impact on public mind. Still, you have to give due credit to BJP. They had an eye on non-Yadav OBC vote. They managed to wean out sections of Dalits too. And when it comes to media strategy, they are far ahead of other parties. Not just mainstream media, social media plays an even more important role. With WhatsApp and Facebook reaching tens of millions in India, and the party's IT cell light years ahead of other outfits in spreading their message, one can imagine the impact of social media on the voters in UP. Media's role is to inform the people and expose the faults in the system. Free press that practices responsible journalism is essential for any democracy. It helps keep checks and balances, puts politicians and bureaucrats in check, while keeping an eye on implementation of schemes and coming up with insights that help us understand the complexities and realities of our society. In the last few years, journalism has undergone a revolutionary change. On one hand newspapers are said to be dying because of lack of readers--the situation is critical in Western countries. On the other hand, New Media has emerged and has posed a challenge to the traditional media. Thirdly, social media has also come up as a formidable source of information and misinformation. In this situation when media groups resort to click-baits to get hits and increase their traffic, we need hard journalism, going to the ground, reporting about issues that may not garner traffic but will reveal the situation of rural India, the healthcare system and the corruption in bureaucracy. 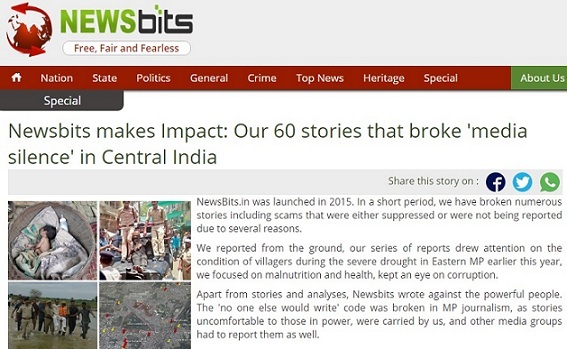 NewsBits is relatively new. It is about to complete a year. But it has carved a niche for itself as an independent news media from Central India--Madhya Pradesh, Chhattisgarh and Vidarbha. As media industry continues to evolve and is coming to terms with the growth of social media, it is necessary that fair and ethical journalism has its place in the society. Caste plays a vital role in a person's life in India. In a way, it like religion or gender, though some might disagree. You may convert to another religion but can you change your caste? It is not just Hindus, but Muslims and Christians too practice casteism in India. 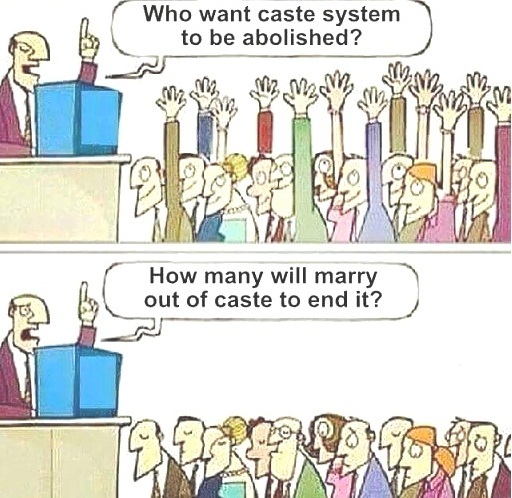 This cartoon sums up the attitude towards caste in the country. Everyone you meet keeps saying that 'caste is bad' and the 'caste system hurt India'. In fact, many even go to the extent of saying that in 21st century, caste is meaningless. But that's far from truth. Caste is a harsh reality in India. This cartoon sums it up well. People do claim that they are against caste system and claim that they have never practiced it. But when it comes to marriage, they search for the partner belonging to the same caste. The fact is that if you search for your partner from the same caste, you are also practicing casteism. You are promoting it, continuing it now and you can't say that you are anti-caste. You may justify but the reality is what it is. Even in colleges, these days, many youngsters 'fall in love' after identifying person of their own caste. Yes, that's true. Some give the reason that they have to marry the person later and they don't want to irk their parents in old age. There are several other similar things that are said to justify marriage and love within the caste. Like, 'same culture', 'it will be easy as our traditions are same' and 'lack of opposition from relatives'. But in in the end, it is about your belief in the caste and practicing casteism. Labels: Caste, Caste discrimination, Caste in India, Casteism, Hindu, Muslim. For over four decades, a Muslim man has been trying to save the ancient temples in India. These temples, many of them are centuries old, lacked upkeep and as a result they were falling apart. Pathan's initiative has resulted in 34 major temples taken over by Archaeological Survey of India (ASI) and hence they became protected monuments, reports journalist Koushik Dutta in Hindustan Times. He had begun the campaign in 1970s when he saw the condition of ancient Siva and Vishnu temples in Pathra town in West Bengal. The 'Save the Temples' campaign began, since then. 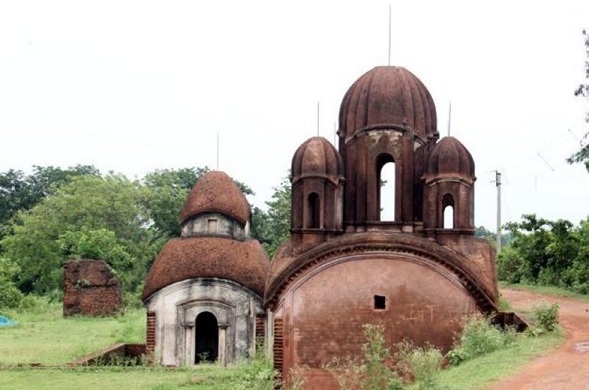 There was no effort on part of government to conserve the old temples. “These temples form a part of our heritage, and I am just doing my small bit to protect them for the next generation,” says Pathan. At a time when instances of religious intolerance are reported from different parts of the country, a 66-year-old Muslim is championing the cause of communal harmony by leading a movement to preserve temples. Retired school peon Yasin Pathan started the ‘Save the Temples’ initiative in the 1970s with an aim to protect the 18 th century Shiva and Vishnu temples in West Bengal’s Pathra village. "The 66-year-old man kept writing to officials concerned in an attempt to draw their attention towards the temple’s depleting condition. The ASI eventually carried out `4-crore worth of preservation work on few of the temples in 2013", the report further says. The complete report is available at this LINK. 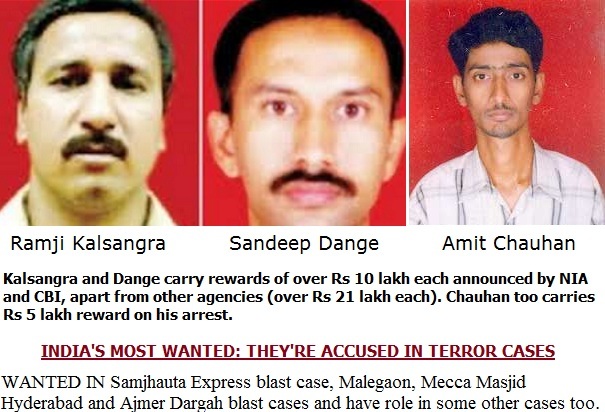 India's most wanted terrorists: Wanted for over 100 deaths but why no one utters their names? They are India's most wanted terrorists. They have been involved in nearly half-a-dozen terror strikes. Over 100 persons including women and children, died in those terror attacks. Yet, no one talks about them. Media won't show their photographs or term them as 'dreaded terrorists'. Several agencies including state police units, ATS teams, NIA and CBI have been on their hunt. They have been on Interpol's list watch-list too. Due to failure of investigating agencies to arrest them, the cases in which they are main accused, have got weakened. Yet, these most wanted terrorists are never talked about in Indian media. They are Sandeep Dange, Ramji Kalsangra and Amit Chauhan. They have been involved in four major terrorism cases apart from suspected involvement in some other acts. For years, they have been absconding. It is speculated that they were in hiding in Nepal. There have also been occasional claims that they were dead or fears that they were 'eliminated'. But, unlike other criminals whose faces are shown on TV channels on a regular basis, these most wanted aren't shown to the public. Is it because the image of terrorist created in public mind, will change? They are involved in Ajmer Dargah Blast, Mecca Masjid Hyderabad blast case, Malegaon Blast Cases (Twice), Samjhauta Express terror attack and Modasa blast (the last case has been closed). For more information, you can find it on NIA's website or from Interpol. Anyone who has information about there whereabouts can inform the agencies and help NIA, law-enforcers in India. 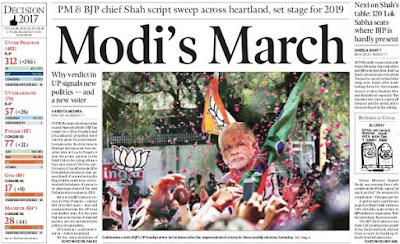 The biases of Indian media were revealed on their front pages on March 9. Two days ago, a suspected terrorist had been shot after an 'encounter' in Lucknow. The papers had the follow-up. Also, in the Ajmer Dargah terrorist attack, a court had delivered judgment on March 8, convicting three persons (one of them dead) while acquitting others. What was the difference in the cases? While the Lucknow incident was splashed and most TV channels termed him 'aatanki', those convicted in the Ajmer case were not termed 'aatanki'. This is despite the fact that the latter were held guilty by a court. They were guilty of bomb blasts at a shrine that was revered by Hindus and Muslims equally, and several people had died in the blasts. However, these persons--Devendra Gupta, an RSS pracharak, Sunil Joshi (dead) who was also an RSS pracharak and Bhavesh Gupta, were not termed either extremist or militant. Not much was told about the accused and their role. However, on TV channels round the clock, the Lucknow suspect was termed 'aatanki' though there was no case or even trial, and he was shot dead in the encounter. Every terror suspect has to be dealt with sternly. If he was involved in terror and wasn't shot, everyone would still demand punishment through legal process. But is that fair that those held guilty by law of involvement in terror, are not termed 'terrorists'. What stops you? What kind of sympathy is that? 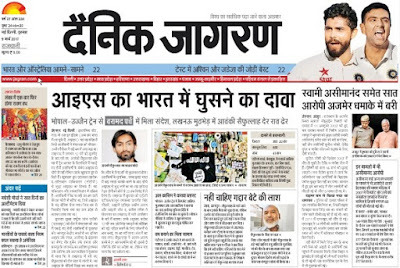 The papers the next day had called him a terrorist and the story was carried on front page and on inside pages too. But the important judgement in Ajmer blast case got little attention. If, at all, the papers carried report, it was about Aseemanand's acquittal, not about those who were convicted. They were not termed terrorists despite their conviction in a terror case. Clearly, it showed how media didn't take the case seriously at all. Many Delhi-based national papers carried the news in a single column. For most Hindi papers, it was about Aseemanand's acquittal though he had earlier given his confession under section 164 before a magistrate and it couldn't be retracted. However, all these facts mattered little to media. TV channels' role was worse. While Saifullah's death was turned into a tamasha and the encounter was shown live, the questions raised were not given due attention. In a major decision, a special court has pronounced judgment in the Ajmer Dargah blast. While Swami Asimanand and six others have been acquitted, three have been held guilty for the terror attack on the famous shrine. They include--Devendra Gupta, Bhavesh Patel and Sunil Joshi. This is not the first case in which right-wing extremists have been sentenced for bomb blasts or terrorism. But it is important in the sense that those accused were not mere RSS members but its functionaries--holding posts of pracharaks. Devendra Gupta was RSS pracharak. Also, Sunil Joshi who died many year ago, was a Sanch pracharak. In the past, when Sangh members were arrested or convicted, it was mentioned that RSS didn't keep record of its members and anyone was free to come or go. Sangh maintained that it was not responsible for activities of those persons. But Gupta and Joshi held posts in the RSS. Bhavesh Patel also had right-wing links. They may have been removed from the posts later, but they had been given duties for years to work in different states as pracharaks. Hence, this case is important as far as Hindutva terror or right-wing terrorism in the country are concerned. Ajmer Dargah is among the most revered shrines in Asia, and is frequented by both Hindus and Muslims. Apart from Ajmer Dargah blast, the right-wing terror attacks were made at Mecca Masjid in Hyderabad, on Samjhauta Express train, in Modasa town and twice in Malegaon in Maharashtra. There were some other minor attacks too. RSS forced to sack its leader for owning up killing 2,000 Muslims in post-Godhra massacre in Gujarat! 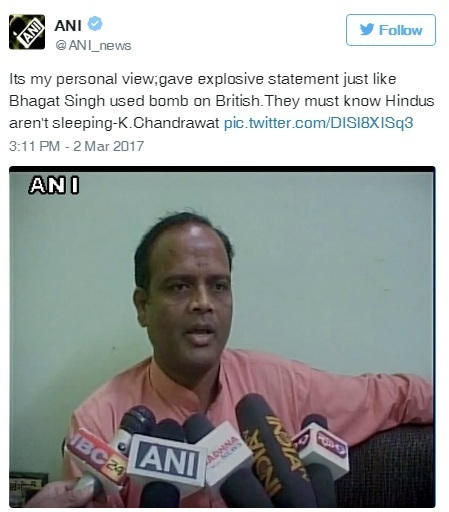 Rashtriya Swayamsevak Sangh (RSS) leader Kundan Chandrawat publicly boasted about killing 2,000 Muslims during the Gujarat massacre. While offering Rs 1 crore [10 million] to anyone who beheaded Kerala Chief Minister's head, Chandrawat reminded the audience that 2,000 Muslims were killed in post-Godhra attacks. "Bhool gaye kya Godhra ko...56 maare the 2000 qabristan mein chale gaye....ghusa diye unko andar...", he said in the speech, which was recorded and is available online too. This is the first-even open acknowledgment in public by an RSS leader. In the past, there have been oblique references and Babu Bajrangi's statement that was recorded in a sting operations. Many others termed it as reaction. What is this mindset? If RSS claims to be a patriotic organisation, how can it have in its ranks people who express pride in killing thousands of their own countrymen? No one questioned RSS top leadership about it. No prime time coverage of this part of the speech. But this was a public speech. And, Chandrawat is an RSS leader who was holding the post of Mahangar Prachar Pramukh in Ujjain, Madhya Pradesh. Though he later expressed apology for the inflammatory speech, action was taken. Not just RSS sacked him from the post, the local police also registered a case. It is rare because in a BJP ruled state, even low-level office-bearers of ABVP or Bajrang Dal don't get cases registered against them prominently. So what was the reason? The fact that he publicly claimed and boasted about killings. Talking as an RSS leader, not just talking about beheading a democratically elected chief minister but also threatening to kill 3,00,000. In the same speech, he said that 300 people were killed by Communist [SFI] cadre in Kerala and this would be avenged by killing 3 lakh [3,00,000]. Unlike an ordinary shakha worker, who can be disowned by saying that he was not a member, Chandrawat couldn't be disowned. He was holding a post. Perhaps, this was the reason that action was taken against Chandrawat. The Sangh leader works in the Malaria department in Ujjain. His statement is not something that can be ignored. While the part of his speech where he said, "Vijayan ka sar kaat ke la de koi mujhe...' [Someone cut Vijayan's head and get it for me", made headlines, the other aspect--acknowledging the role in post-Godhra killings hasn't got the same coverage. Has there been any denial by any senior functionary? Was any RSS official including Sarsanghchalak asked by mediamen about reaction on this claim? There is lot of silence around. But Chandrawat has said, and it is on record, now.